Welcome to exaktsaw.org.uk – your number one resource for information about the Exakt Saw - Compare Prices of the Exakt Saw Here - If you want to be able to safely cut through different material with just one power tool, then this innovative saw is the one you need. You can cut wood, metal, plastic, ceramic, laminate, tiles and slate quickly and effectively without the need for three different saws. 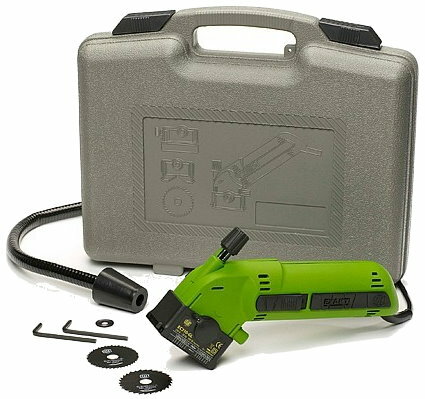 The cutting blades supplied with this power tool enable you to cut through material up to 12mm in thickness, and with the saw blade spinning at 4,000rpm any cutting you do will be much quicker than any hand saw. The Exakt Saw also has a blade guard making it safe as well as fast. There will be no messy sawdust to clean up as the saw comes with an extraction hose which can be connected to a vacuum cleaner to clean away any dust at the same time as you use the Exakt Saw. This clever tool is suitable for both home DIY use and for professional use, and will give you professional looking cutting even if you are a complete novice as the exaktsaw is very easy to use. Included with the Exact Saw is a handy carry case which is sturdy and has room for the saw and all its attachments which include three blades and the dust extraction hose. The first blade is suitable for cutting wood including medium density fibreboard (MDF), laminate flooring, chipboard and plywood. The second blade is ideal for cutting plastic and aluminium. The third blade is diamond edged and is designed to cut through ceramic tiles.